Child care providers who have direct responsibility for the care and oversight of children, including center staff and family child care providers, must complete certain trainings to comply with the Vermont Child Care Regulations. The full list of these training requirements are available on the Child Development Division website by clicking HERE. This course explores the importance of immunizations in protecting children and staff from vaccine preventable diseases as well as child care providers’ roles and responsibilities related to the children in their care. Technology Requirements: This course is accessible on most computers with internet access. It is not accessible on a cell phone or many tablet devices. You will need Adobe Acrobat Reader to view some of the handouts required for use in the course. Adobe Reader can be downloaded for free. 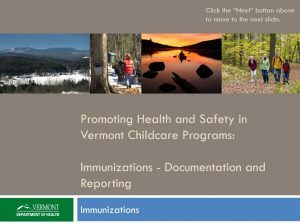 For support with this training or any questions about immunizations and documentation, please contact your local Vermont Department of Health office. A free, 2-hour online module for child care programs of all types and sizes that provides knowledge and tools to analyze hazards and threats at your child care site, develop a plan to address them, and update and practice your emergency plan. This training meets the Vermont child care program licensing regulations requirement for training in emergency preparedness. Enhance your knowledge around family homelessness and the McKinney-Vento Homelessness Assistance Act’s definition of “homeless” as it refers to children and youth. Review other relevant federal regulations for Head Start, Early Head Start, and Child Care and Development Fund (CCDF)-subsidized programs. Learn how to identify families experiencing homelessness, conduct community outreach, and much more. This training meets the requirements identified in Sec. 98.51 of the CCDF regulations. IMPORTANT: In order to count toward annual training requirements for the Vermont Child Development Division and to count toward Advanced Specialized Care training criteria, you must submit completion certificates for all modules together in one batch to Northern Lights. This course provides participants with an understanding of their role in supporting children and families who experience homelessness. The course explores the prevalence of homelessness as well as its causes and impacts on the developing child. Participants will discover ways they can promote positive outcomes for those who are affected by homelessness through a variety of policies and classroom practices. This training meets the requirements identified in Sec. 98.51 of the CCDF regulations. This training also meets the criteria to count toward annual training requirements for the Vermont Child Development Division.